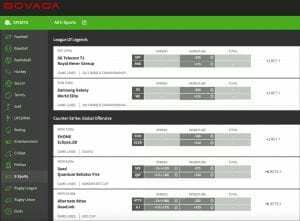 Bovada.lv is an online sportsbook offering the best esports betting markets for North American bettors, in addition to traditional racing and sporting markets and separate real money casino and poker sections. Operating since 2007, it has built a trusted reputation among many for its generous bitcoin welcome bonuses, prompt deposit and withdrawals, and range of betting markets. But does its esports section offer enough for CS:GO, Dota 2 and League of Legends fans looking to wager on their favourite events? This review delves into what’s presently offered at Bovada. Bovada sportsbook caters exclusively to bettors from North America (USA) only. Bovada does not explicitly list its current exclusions and restricted countries in its terms and conditions, but speaking with customer support will confirm they do not accept sign-ups from outside of the USA. Certain states in North America are prohibited from signing up at Bovada, so if you are a resident of any of the following states, you unfortunately cannot play at Bovada at this time: Delaware (DE), Maryland (MD), New York (NY), New Jersey (NJ) and Nevada (NV). If you are reading this review from another country or an excluded state, please visit our esports betting sites guide to find the best online sportsbook legally catering to sign ups from your region, as well as the best digital destinations to bet on CS:GO, Dota 2, League of Legends and more. Bovada.lv offers two regular welcome bonuses for all new sign-ups who create a sportsbook account and deposit at least once. 1. 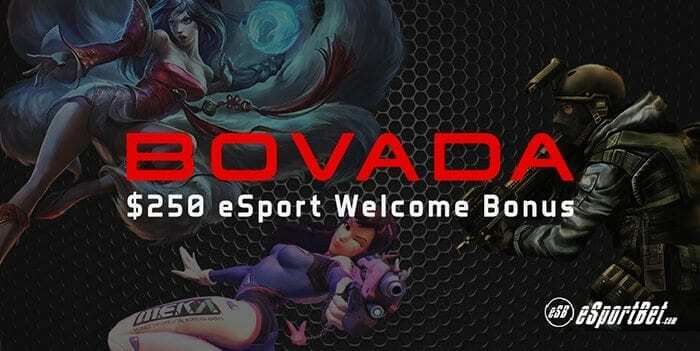 Sports Welcome Bonus: Bovada offers all new sign-ups a 50% Sports Welcome Bonus up to USD $250, which can be used on all of their esports betting markets. Just deposit and Bovada will instantly match your deposit and credit your account, with the bonus available for wagering within half an hour. 2. Bitcoin Welcome Bonus: Bovada offers all new sign-ups who deposit and fund their betting account using Bitcoin cryptocurrency a match bonus of 50% up to $500. You must use the bonus promo code, ‘BVSBITCOIN50’ at checkout before processing your account deposit. As with all online betting sites, there are roll-over rates, also called playthrough requirements or wagering requirements, attached to the bonuses to stop players from simply claiming the bonus and abandoning the account thereafter. Bovada sets a standard X5 rollover on both the initial deposit and the bonus amount on all bets made on esports and sports markets – basically, you need to bet five times the amount of your deposit and bonus before you can withdraw any potential winnings or leftover funds. Rollover for esports and sporting bets are determined by the lesser of your risk or win amount at the time of the wager – for losing wagers your risk amount will be credited towards your rollover contribution. Overall, Bovada’s welcome bonuses are decent, especially considering the increasing prevlance of bitcoin betting and the flexibility it affords US-based esports fans. The wagering requirements are low and not too excessive like at other sites, and the bonuses were credited to our accounts within minutes from our testing period so we could place our bets on the latest CS:GO and League of Legends tournaments with some extra credit. One unnecessarily harsh rule set by Bovada is if you withdraw before their bonus terms are met, all bonus funds and money earned with said bonus is forfeited – we think it would be better if the site simply blocked unknowing players from processing the withdrawal instead of snatching away everything. Bovada uses the instantly recognisable classic design template of the Bodog brand of online sportsbooks and casinos from back in the day and while it is a little dated in the aesthetic department (with a drab gray and red colour scheme), it is still clean, functional and easy to navigate for both inexperienced online bettors and those familiar with placing a bet or two. The site is well optimised on both desktop computer and mobile devices, so you can easily place a bet on the latest CS:GO or LoL match on your Android or iOS smartphones and tablets. The FAQ, sports betting markets and casino, poker and racing sections are easily accessed on the left-hand pane; clicking (or tapping, if on mobile) the sports section will expand to display all 20+ available markets, along with the admittedly niche esports category. What esports events can I bet on at Bovada.lv? Bovada.lv’s esports betting markets are focused mainly on the world’s most popular pro gaming tournaments, such as the League of Legends World Championships or the Dota 2 International. We were not able to find many options to bet on events outside of the most popular titles at the time of review. Most types of bets available were moneyline or spread, but CS:GO and Dota 2 markets offered first blood and map winners markets. Overall, Bovada’s esports betting markets are evidently not as expansive as it could be, even if it isn’t Bovada’s main attraction, but what is on offer is a decent enough selection for US-based fans given the majority of events are held in the USA with home-grown teams participating, and are also easily accessed via live-stream. With a bit more time, hopefully they can offer some markets on up-and-coming esports phenomenons such as Hearthstone and Rocket League. What other sports can I bet on at Bovada? Like most US-facing online sportsbooks, Bovada has a limited range of esports payment options available due to the many banking restrictions indirectly placed on US-based players when it comes to online gambling. To their credit, the site has made sure to support the most popular services globally for peace-of-mind, so the majority of North American bettors won’t have a problem finding a suitable option for them. For starters, credit card (MasterCard, Visa) is fully accepted, alongside alternatives like bitcoin which is heavily pushed by Bovada, as evident by their welcome bonus. You can also use MasterCard, Visa and some Visa Gift Cards to fund your Bovada esports betting account but you must make sure the gift card is allowed to be used for ‘International and Online Purchases’ prior to buying it, otherwise it will not work. Bitcoin, MasterCard and Visa credit cards have a minimum and maximum deposit of $20 and $1,000, respectively. What new players need to be aware of is by default, withdrawals can only be processed in either bitcoin or check by courier. Bovada does not list additional methods until you actually contact support support and provide your account details, which is unnecessarily obtuse. In terms of processing times, deposits are instantaneous, while withdrawals take up to 48 hours for bitcoin and 10 – 15 business days via check by courier, which is much longer than many alternative options. Another very crappy reality with depositing at Bovada is the extra fees imposed by the bank. All deposits made using credit card carry a 5.9% charge, while bitcoin is completely fee-free. Make sure to take this into account prior to your choice of deposit method. Withdrawals fees on the other hand are covered by Bovada your first transfer using an eligible method every 90 days, with a $100 processing fee for additional withdrawals within the same period. The United States Dollar (USD) is the only currency supported at Bovada.lv, due to the site exclusively catering to North American players. Bovada’s customer support is fairly standard due to lackluster knowledge provided by most of the representatives we spoke to. Their phone hotline took a long time to answer our basic questions regarding deposits, and the live chat wasn’t any better. Email response was virtually non-existent. Thankfully their FAQ page answers the majority of questions around payment methods and processing times, because we otherwise would be left out in the cold – many of these answers are buried within sub-menus rather than readily accessible. Bovada supports the English language only. Bovada.lv uses standard 128-bit Secure Socket Layer digital encryption technology to safeguard personal information and financial information processed on and shared with the site. which is the same system used by banks and other sites handling payments – it keeps player information (contact and financial) safe, and is the security standard all esports bettors should look out for when choosing a site to bet at. Bovada.lv is an above average online sports betting site which offers a decent range of CS:GO, Dota 2, League of Legends and StarCraft esports betting markets, along with 21 other popular sporting categories. It definitely isn’t the best online destination for esports betting due to its main focus on traditional racing and sporting events, but for North American esports fans with limited wagering options, Bovada is definitely better than a lot of other unregulated betting sites out there. We hope to see further improvement with its customer support and expansion of its esports section to include other popular games like Call of Duty and niche up-and-coming titles like Rocket League in the near future.